PHILADELPHIA, PA – November 12, 2018 – Janney Montgomery Scott LLC (“Janney”), a leading full-service wealth management, financial services, and investment banking firm headquartered in Philadelphia, PA, has added a three-person team to its branch office in Glastonbury, Connecticut. The team is comprised of Gary Halter, Senior Vice President/Wealth Management; Benjamin Halter, Financial Advisor; and Sharland Baker, Senior Registered Private Client Associate. They were previously affiliated with RBC Wealth Management. Gary Halter has been managing individual and small business investment accounts for over 35 years. He is a Retirement Income Certified Professional® and earned his B.S. degree from Virginia Tech. Accompanying Mr. Halter to Janney is his son, Benjamin Halter, Financial Advisor, and Sharland Baker, Senior Registered Private Client Associate. Prior to serving as a Financial Advisor and Complex Operations Associate at RBC, Benjamin Halter earned his B.S. in Finance from Bentley University. Ms. Baker also joins Janney with nearly two decades of experience in the financial services industry. 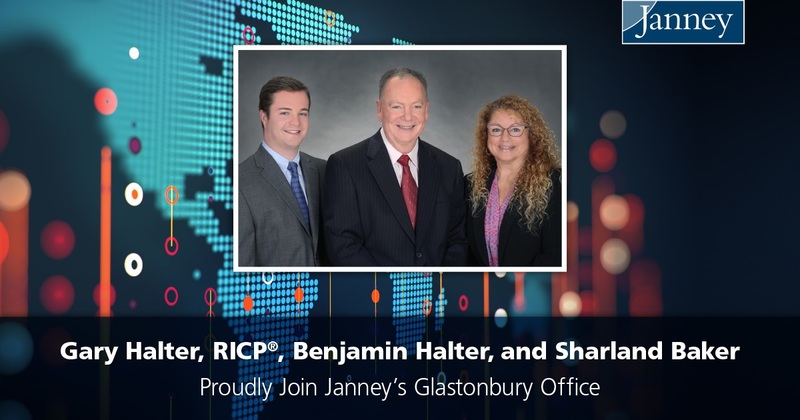 Gary and Ben are the third and fourth Financial Advisors to join Janney’s Glastonbury branch office in 2018. With their additions, Janney has added a total of eight Financial Advisors to its Connecticut Complex this year. Janney’s Glastonbury, CT office is located at 180 Glastonbury Blvd, Ste 302, Glastonbury, CT 06033.